Yesterday, we featured a lovely Lego sculpture of a running fox by Bangoo H. As one might expect, that was not Bangoo H’s only biologically inspired work. 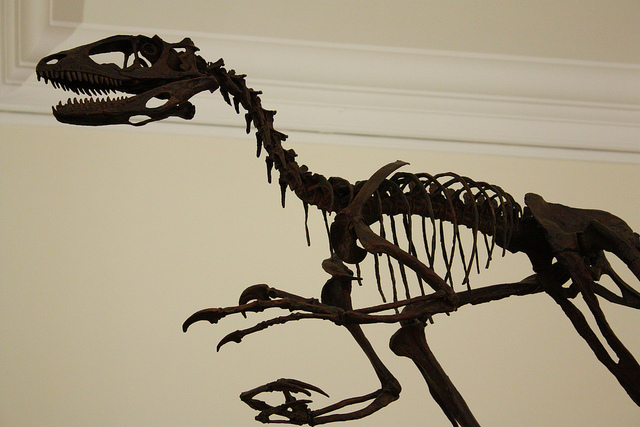 My eye was caught by this depiction of a velociraptor skeleton, which instantly transported me back to Cambridge, UK and the skeleton of the velociraptor’s close relative, Deinonychus, displayed in the Sedgwick Museum. Like any museum the Sedgwick Museum had its large, dramatic display pieces. It also had collected items crammed into every conceivable space and drawer (like the fossils of sea urchins in the slide show). There was always too much to take in everything with a single visit. So, each trip involved new discoveries, depending on which cases we chose to explore, which was part of the reason it was a fantastic place to bring our kids over and over again. This entry was posted in Have Science Will Travel and tagged allosaurus, archaeopteryx, Bangoo H, Cambridge, cave bear, deinonychus, icthyosaur, Lego, plesiosaur, sea urchin, Sedgwick Museum, velociraptor. Bookmark the permalink.